This organ was made for playing with viols and viols consort. It is based on the organ made for Sir George Shirley in about 1630, for his house at Staunton Harold in Leicestershire, where he also employed the young William Lawes, who compiled the Shirley part books for the household’s viol playing. Most of the pipes and the windchest from this organ survive, now in the church next to the house. All the pipes are made of pine, with oak blocks, tuning stoppers and caps. The key compass is C to c³ (49 notes). The Open Diapason starts at c#¹. The pitch is a¹=415Hz. The tuning uses the Erlangen temperament, with pure fifths, and the comma divided over two fifths, d-a-e so that some thirds are good. The pipes are all cut to length. 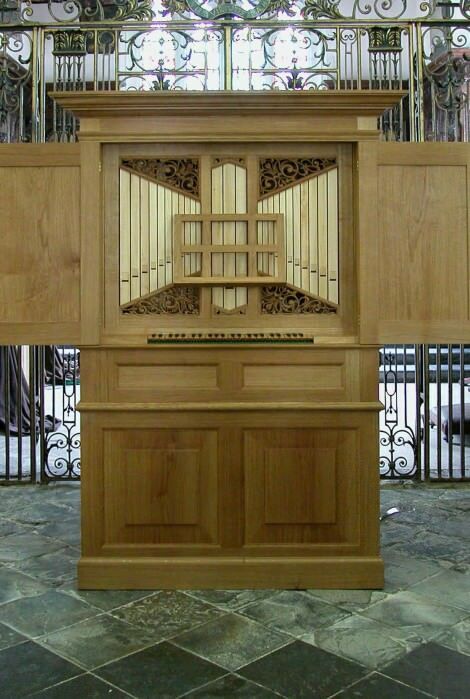 The oak case is 200cm high, 120cm wide and 72cm deep.